What’s Under My Fridge – 297/365, BlackBerry 365, Golden Valley, Minnesota, October 2010, photo © 2010 by QuoinMonkey. All rights reserved. On October 17th my brother had his third liver transplant. By all accounts, it is a miracle. And something that’s hard to wrap your mind around. It all began with a text: 10/17/2010 @ 9:48am — they called me with a liver. going to Philly now. Will let you know if they will be doing the operation. I’ve been trying to write a piece about it ever since. Eleven nights have passed; the day to day ekes away energy and time. If you put all the days together, well, that’s a lifetime. We think we can prepare for what lies ahead, try hard to be in control. Sift, collect, let go, wait. Sift, collect, let go. Wait. Yeah, we spend a lot of time waiting. The best laid plans fall hard. Somewhere between collect and let go, there are surprises. Laundry spins, rattling the floor, defying gravity. Water and fire boil, cooking spaghetti for dinner, but only as fast as the barometric pressure will allow. No amount of wishing can make the dust bunnies go away. You would think that would be disappointing. You would be wrong. Vacuum under the desk, behind the piano bench, above the paper towel holder. Slide the giant green bottle brush under the fridge again and again and again. Thick rolls of cotton batting dust slide easily over freshly mopped floors. But what are those brilliant points of light, gleaming stars through the Pigpen fog? Exactly 26 Mr. Stripeypants balls. Silver, gold, and the primaries, blue, red, green and yellow, lost to the swipe of the mighty Pants paw. He loves the small ones with the soft sparkling spikes. He would keep me playing fetch for hours every morning if I didn’t grab the purple lunch pail and fly out the door, late for work. Liz has a big heart for the animals. 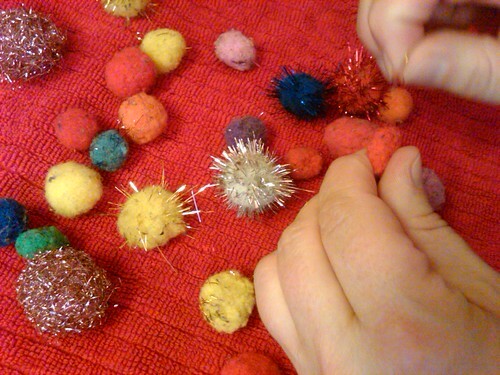 She carefully peeled and plucked the dust off of every tendril, washed each felt ball with warm water, and sat the bunch on the counter to dry. Life can change in an instant. You can’t come back the way you came. It’s the simple things that make the day. They are as big as the miracles that make me a believer. In something bigger and better on the other side. Are there dust bunnies in heaven? I like to think they hop to a different beat. My brother came home from the hospital on Tuesday, Frankenbelly 3 in tow. His 4:25 text said: on the turnpike – ETA 6:45 to 7:00 PM. I’ll eventually write the piece about his transplant. Tonight culminates in the midnight ramblings of a harried woman….and a plane ticket to Pennsylvania. ETA November 9th, 11:28am. I didn’t have to even think about this. My favorite shoes are my fuchsia high tops, which I bought at Ross’s a few months ago. 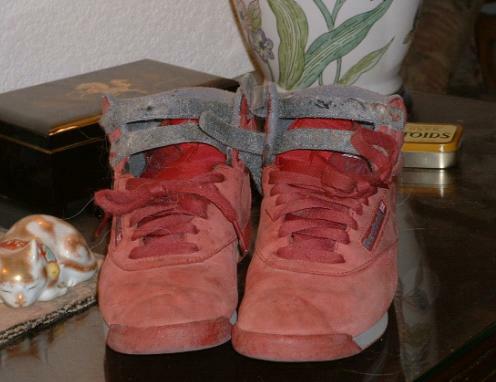 In fact, it already makes me sad to know that some day these shoes will be a thing of the past, the red suede is already getting worn out and faded in places, especially around the toes. That’s because I wear them all the time, even in the rain and snow and mud. And then there was the time I picked up a bottle of lotion in Big Lots and the top fell off and the stuff spilled all over the left shoe. I was so upset I ran to the bathroom to try and blot the stuff off with scratchy paper towels. I’d only had them two weeks, and it felt kind of like that first accident in your brand new car. I even stopped to talk to the cashier, threatening to sue the store if the stain didn’t go away when they were dry. I remember how she leaned over the counter with a puzzled look on her face, looking at my fuchsia high tops. But I want to tell you more about why I love them. First of all, they’re that bright playful color, and the day I saw them, they screamed at me, “here! We’re over here!” and I put them in the little top part of the shopping cart and wheeled all over the store with them. I kept looking over my shoulder too, certain that someone else would probably covet them and that I had snatched the last pair. But then I saw another pair, and had a moment of doubt. Maybe they weren’t so special after all I began to think. But then I looked at them again fondly and just knew I had to have them, especially since they were just 10 bucks. Then there’s the arches too, soft and cushy and lots of support. And the way they fasten – laces on the bottom, and two velcro straps running across the tops. The really good part about this is that I can slip them on and off without unlacing them and I don’t have to smash down the heels. Which brings to mind mules. I was over fifty before I discovered mules – those dorky looking sneakers that have no heels. But come to think of it, I guess they are not heels are they? What I mean is the back part of the shoe that rides up over the heel. High Heel Sneakers, I think that’s my favorite shoe song. But why hasn’t anyone written a song about platform sneakers? You know the kind I mean – the ones that have a two or three inch platform running the entire length of the shoe. Come to think of it, I don’t think I’ve ever actually seen a pair of high heel sneakers – do such things exist? But what I really want to know, is what do you call that back part of the shoe, if it isn’t the heel. And now I’m thinking of all the opportunities I had to ask this question in fancy shoe stores I used to shop at and in dry cleaning places that do shoe repair. But I never asked, never even thought to ask, assuming as I did then that I knew all there was to know about shoes. I guess I’ve always liked colorful shoes, bright things on my feet that make me feel like dancing though I haven’t danced in many years, and don’t really like to dance except with my dogs. Just last summer I bought a pair of cyan platform thongs. They made me about three inches taller (this is important) and were such an electric shade of turquoise that I felt neon when I wore them, not to mention, tall. I think I picked those up at TJ Maxx for $2. But just when they were starting to get comfortable, I left them in the living room one day and when I got home, found that one of the dogs had chewed the heel on the right one. 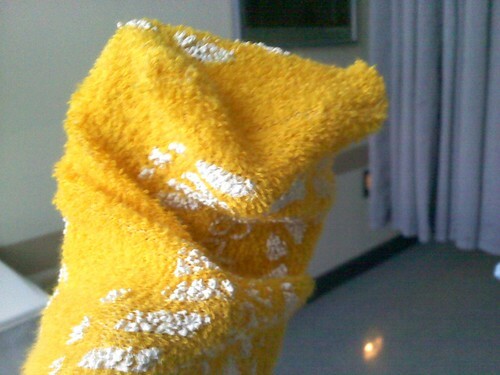 He took off about a half inch or so, and when I wore them to the grocery store that night I found I was limping. But my favorite shoes of all times were the deep purple/royal blue/wine red two-inch heels I spent $75 on in 1989. I’d never spent that much money on shoes before, but these had me hypnotized, and they were that soft creamy leather that you love to touch. I used to take them any time I traveled, in case I had to get dressed up for something, and for some reason I even took them home with me when my mother died. It was the middle of February, light slushy snow on the ground in the cemetary, and I left them in the closet that day. Following the service, our house would be filled with visitors, and my brother had locked all of his dogs, including his new puppy, in my bedroom to keep them from messing up the house. When we got back from the graveyard I went down the hall and to my room to change into the black kaftan I wore each day of shiva that week. And as I went to the closet to find a pair of slippers to replace my wet boots, I saw the damage. Just one shoe, the heel mangled to where the white plastic showed through, like the shiny bone of a piece of raw chicken. The other shoe was perfectly intact, and I felt like everything, my mother, my shoes, my life, was slipping through my hands. And I felt stupid and guilty too, for grieving over a pair of shoes. The puppy wriggled at my feet and wagged her tail but I was still pissed. I took the chewed up shoe to three shoe repair places, but each man shook his head sadly, like he was giving a prognosis for terminal cancer, “nothing to be done,” they said. I think that might have been the last time I spent more than $40 on a pair of shoes. Fuchsia High Tops, photo © 2008 by dzvayehi. All rights reserved. About writing, Diane says: They say we create our own realities. What scares me most about writing is I see myself creating my own past. I have been working on a memoir on and off for about six years now, more off than on. It began when I told my brother, as he was dying, that I would publish his paintings and poetry. It seemed so simple a thing to do at the time. But then, when I began to think seriously about it, I felt that I would also have to write something about who he was. And so I began my writing journey, taking workshops and joining writers’ groups, telling people I was working on a memoir about my brother. Then people began asking if I was writing about my brother or myself, and soon, I began to ask myself the same question. I also began to realize that as much as we may love someone and think we know them, they are still an unfathomable mystery in the end. And with each step further down that path, I found there was a story in me that wanted telling too. The more I write the less certain I am about what I remember, and sometimes I am left wondering who was living those lives I thought I had witnessed. I’ve taken workshops that talk about theme and character development and story arc and plot, and I have looked for these elements in my story and am still looking. As my own story unfolds, through writing and therapy, I am often surprised and humbled by what I learn. 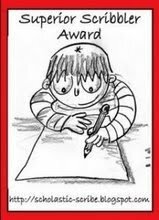 Most of all, I am grateful for the actual gift my brother gave me – the path of writing. Even if I never complete either story, or never publish, writing has brought so much into my life, especially the other writers I have met, in workshops, groups, and in books.